Commercial, municipal and institutional establishments such as schools nursing and assisted living facilities, rehabilitation centers and hospitals and churches are required to create and operate reycling programs. This includes owners of apartment buildings with four or more units. * Leaf waste including leaves, shrubbery, Christmas trees, tree trimmings and similar vegetative materials. Materials should be stored separately until picked up. Businesses are required to handle and arrange their own waste and recycling collection. First, it's the LAW. There are also several appealing resons. Why send something to a landfill if it can be reused? Recycling saves money and resources. Reducing trash lowers disposal costs. There are also companies that buy recyclable material which helps offset the cost of compliance. How Do You Start Recycling? 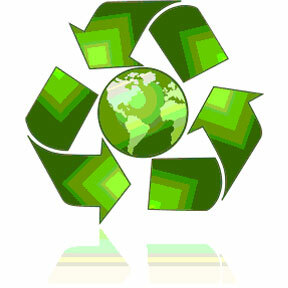 * Top level management support...The success of your recycling program hinges upon the endorsement of senior management. Their positive support promotes a similar attitude among the establishment's employees and customers. Also, recycling programs often require initial outlays of capital. * A coordinator...Commerical, municipal and institutional establishments are required to create and operate a recycling program. This includes owners of apartment buildings with four or more units. * A task force...To assist the coordinator in developing the initial program. Custodial staff, administrative staff, and educators should be included. * A waste audit...To determine who's throwing away what and how much is being trashed. Reduction and reuse should also be considered. * A market investigation....To determine where your recyclable materials can be processed. Most waste haulers offer collection of recyclables. Some companies buy recyclable material. * A convenient collection system...With attractive, easy to use containers near the action next to the computer and soda machine or a central storage area. Personnel are needed to collect and record information on how much of what is being recycled. * A review of procurement policies ....To determine if other products can be subsituted for current supplies that are recyclable and/or made of recycled materials. Perhaps current buying practices can be revised. * An education program....To inform staff about the program, program goals, the value of waste reduction and recycling, and periodically encourage people to continue recycling. Remind them they're doing the right thing to help themselves, their community and the environment. In 1998, Pennsylvania passed Act 101, the Recycling and Waste Reduction Act. This is the act that got Pennsylvania Recycling! The Act requires recycling programs for municipalities with a population of 10,000 or more, or for municipalities with a population of between 5,000 and 10,000 people and a density of 300 people per square mile. Non-residential establishments are required to recycle. Non-residential is defined as commercial, municipal, or institutional. Included in this are apartment buildings with four or more units. Municipal implementation of recycling programs shall include, at a minimum, the following elements: High grade office paper, aluminum, corrugated paper, leaf waste and other materials deemed appropriate by the municipality generated at commercial, municipal or institutional establishments. It's the law, and it's a good idea! As waste disposal costs continue to rise, recycling can reduce your waste volume, and may save you money.